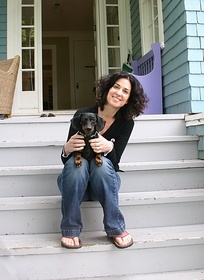 I've written two novels: "We are all fine here," (Putnam, 2005) and "Gone to the Dogs," (St. Martin's, 2009). I currently live in Los Angeles and am working on another novel. Thanks so much for your lovely comment and fav on my little story "things." It's nice here, I hope you enjoy yourself. i like your blog, too and linked to it on http://marcusspeh.com - not that it matters. surely it was not I who rejected your story at MR, lol? ray seems v v cool. he and i ahve been exchanging some notes. hi mary guterson!!! look, there's a dog in your picture!!! Hey, welcome MaryG. I'm honored to be your first FN contact -- can't wait to see your short-shorts! You must log in to write on Mary Guterson's wall.